When I want a high strength posterior bridge material, I go with either the Sirona Zirconia or Ivoclar ZirCAD LT. 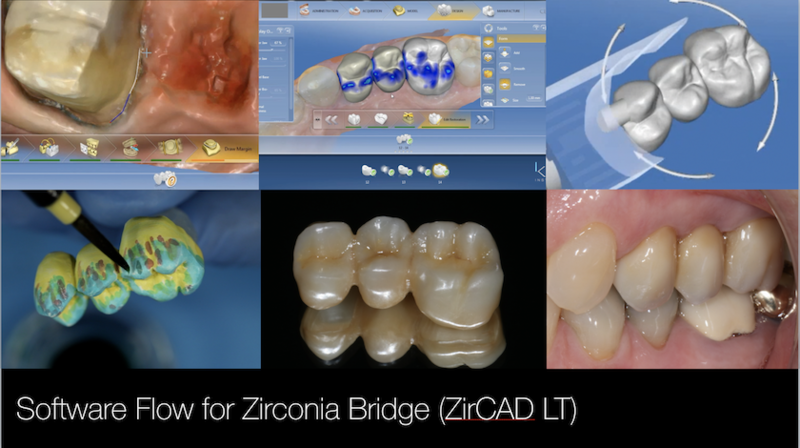 This CEREC bridge software flow video is the first in the posterior zirconia bridge series, start to finish. High strength zirconia at this point in time is not the easiest to handle when it is not in the shadows of the mouth. In this case, ZirCAD LT Coloruing Liquids were used on the green zirconia surfaces before sintering. This is where most of the multi-coloring effect happens and then is lightly characterized after sintering with Ivocolor glaze and stains. Enjoy the series.